The term güherse refers to decoration consisted of tiny metal beads welded onto articles made of silver and gold. Güherse is a very ancient ornamental technique for metalwork, probably discovered because of the natural tendency for the noble metals to form drops when cooling from the fluid state. Mesopotamia, a region which was cradle to civilisation in many different respects, is also where güherse work was first discovered. It was in the hands of Turkish jewellers, however, that it was taken to its final stage of refinement. During the Ottoman period jewellers became so expert that today it is virtually impossible to replicate their work. Güherse involves overcoming two major problems; the first to produce equal sized drops, and the second to weld these to the metal surface of the object. 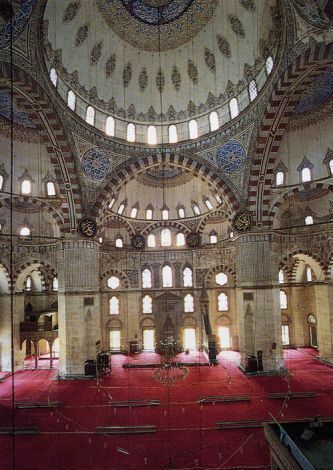 The Ottomans mastered this technique to perfection, producing beautiful works of art. Two practical methods can be used to produce drops of equal size. The first is to wind finely drawn gold or silver wires around a thin nail without leaving any spaces. This forms an even spring, which is then re-moved from the nail and cut down the centre to produce tiny rings. These are placed spaced apart on an asbestos sheet and heated with a blowtorch. As they melt, the rings form drops, which fall into a bowl of water where they cool into equal sized balls. Until thirty or forty years ago, this process was carried out on a log of walnut from which the oil had been scorched out.Alternatively the drawn wire can be measured into equal lengths and then melted to form drops in a similar way. However, both these methods are only practicable for small quantities. To produce beads by the hundred, a different method entirely was required. Oak charcoal was pounded to powder and tiny pieces of silver of equal size mixed into it. This mixture of silver and charcoal dust was poured into a pan made of cast iron or thick sheet metal, which was placed on a fire of oak charcoal. As the charcoal dust heated to the same temperature as the charcoal of the fire beneath, the pieces of silver melted into drops, but were prevented by fusing together by the charcoal dust. Although simple in principle, success in practice depended, like so many of the traditional arts, on the skill and experience of the craftsman. The pan was then removed from the fire and the contents poured into a sieve to remove the charcoal dust. The beads were then poured into sulphuric acid to brighten them.Every metal and alloy has a different melting point, which is why when two pieces of metal are to be attached, they must be of the same standard. For example, silver beads of 900 parts per thousand must be used on a buckle of the same standard. Having obtained the silver beads, it was time to weld them to the surface. Unfortunately, there are no clear contemporary accounts of the welding techniques used by craftsmen in past centuries. The technique used today is to gouge out tiny depressions with a sharp ended instrument at the points where the beads are to be welded. This serves both to prevent the beads rolling away and to hold the borax paste which is applied with a brush. A flame is then passed over the work and the balls are thus fused to the surface. Güherse ornamentation is as delightful as it is difficult, and articles of many kinds were decorated in this way. Buckles, coffee cup holders, tepelik (decorative metal caps worn over headdresses), harnesses and scabbards are among the items to be seen in museums and private collections.